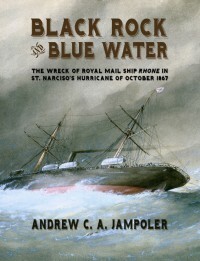 The story of the beautiful and nearly new Royal Mail Ship Rhone, sunk in the Caribbean during the terrible hurricane of October 1867. Rhone was the proud flagship of the Royal Mail Steam Packet Company, based in Southampton and operating a scheduled, twice a month luxury passenger and mail service between ports in the Caribbean and the UK for the previous 25 years. The system’s hub was at Charlotte Amalie, capital of St. Thomas, closed to shipping that October by yellow fever. Breaking for the safety of the open sea from her anchorage off Peter Island as a hurricane blew down the Drake Passage, RMS Rhone soon ran hard aground off Salt Island on tiny Black Rock at full speed. The impact broke her in half, throwing a lucky few of her crew over the side, but drowning or (as her boiler blew up) scalding to death almost all the rest. Several others survived the storm by clinging desperately to Rhone’s rigging until the winds passed and the skies cleared the next day. The dead are memorialized by a monument at Southampton’s historic cemetery. The great storm was followed by a tsunami two weeks later. These three great trials devastated the islands. Recovery from fever, hurricane and tsunami took many years. The wreck of RMS Rhone in the British Virgin Islands Marine Park is one of the world’s most popular scuba dive sites today. It is easily accessible. Diving in the British Virgin Islands.